catching 20 bass weighing 50-14! 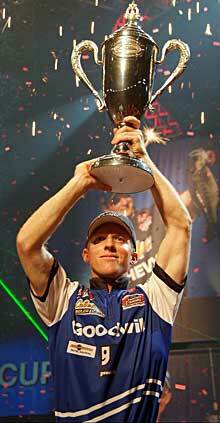 DULUTH, Ga. (Aug. 8, 2010) – Kevin Hawk, originally of Ramona, Calif., but recently of Buford, Ga., crossed the stage with a five-bass limit weighing 14 pounds, 13 ounces Sunday to claim the title of Forrest Wood Cup champion on Lake Lanier. Hawk, with a four-day total of 20 bass for 50-14, won by a 2-pound, 6-ounce margin over Cody Meyer of Grass Valley, Calif., who caught five bass weighing 9-13 for a four-day total of 20 bass for 48-8. Sunday’s final weigh-in marked the finale of the 2010 Forrest Wood Cup, which featured 78 of the world’s best professional bass anglers. Hawk, who would have earned $500,000 for his Forrest Wood Cup victory, was pleasantly surprised when T. Boone Pickens, a new equity partner in FLW Outdoors, personally contributed $100,000 to the champion. With that, Hawk took home $600,000 for his victory on Lake Lanier. Hawk relocated from California to Georgia in November 2009 after he qualified as a pro for the 2010 Forrest Wood Cup through the 2009 FLW Series National Guard Western Division. He said the clear western waters he was used to are very similar to Lake Lanier. Hawk said he concentrated on fishing between Brown’s Bridge and the dam on the south end of the lake. “Today they started biting the (Swarming Hornet) Fish Head Spin really good and when they started doing that, I knew I had to set down that spinning rod and cover as much water as I could and hit as many brushpiles as I could with the Fish Head Spin, because the Fish Head Spin is going to catch you better quality fish on average than a drop-shot (rig) by far,” Hawk said. Hawk said he threw the ½-ounce Albino Fish Head Spin on a cranking rod and 10-pound-test fluorocarbon line paired with a white Zoom Super Fluke Jr. Hawk said his drop-shot setup consisted of a Morning Dawn Roboworm paired with a 3/8-ounce drop shot weight on a 12-inch leader and 7-pound-test line fished from a drop-shot rod. Hawk said he did not plant any brushpiles of his own because he felt there was enough brush in the lake; all he had to do was find it with his electronics. “I didn’t feel that I needed to go as far as to put out my own brush,” Hawk said. “You need a boat that you’re not going to tear up doing it with, and it takes a lot of time and work, and I felt with as much pressure as there was on the lake, every single point and every single hump has brush on it. So I felt that I could ride around and hopefully find enough.